Bon Scrapatit Designs: NO APRIL FOOLING HERE Y'ALL - IT'S FREEBIE TIME AT BON SCRAPATIT DESIGNS!!! NO APRIL FOOLING HERE Y'ALL - IT'S FREEBIE TIME AT BON SCRAPATIT DESIGNS!!! Gosh, I've SOOOOO missed y'all!!! I've been BUSIER than a bee collecting nectar and I'm pregnant!!! ROTFLMBO!!! APRIL FOOLS!!! He, he ... Can you EVEN begin to guess HOW many times I've used that one over that last UMPTEEN million years!!! Too many to count! However, I was not always foolin'!!! I have SO much to catch y'all up on and I'm going to have to spread it all out over DAYS!!! Since I need to catch Maria's search engine, I'm going to get your FABULOUS FREEBIE posted right quickly and I might just hop back on here in the morning and post some photos. I thought it might be best if I just put them in a slideshow, although I'm not sure how much time I'll have to spend working on them!!! Y'all KNOW how that goes! Good intentions, but the 'ol schedule dictates!!! Okay, I've got a RIDDLE for you. What did Mark and Jessica's baby shower this past weekend have in common with Chicago??? 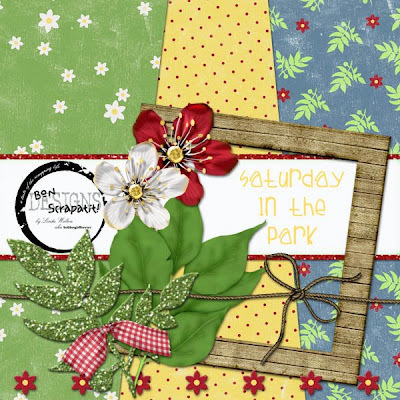 The answer is the name of your FREEBIE tonight - "Saturday In The Park"!!! WOO HOO!!! One of my ALL-TIME most FAVORITE bands too! Gotta LOVE the brass, not to mention the vocals!!! I had to switch gears from working on my collaboration for the May Treasure Chest over at TTS and used a COOL Kuler color swatch from Adobe called "FRESH" and VOILA!!! It somehow started reminding me of our day at Utica Park in Angels Camp as we had a FAB time with the kids and seeing how SPOILED Ozzie is before he actually gets to come out of his "womb" to play!!! I can't wait y'all - ONLY three more weeks and I'm a BONA, BONA FIDE Grandma!!! He, he ... NO excitement HERE - NAH, none AT all!!! APRIL FOOLS again!!! Okay, I know, GO TO BED Linda!!! YEP - could be the RUM DUMMY hour is FAST approaching! Have a WONDERFUL Wednesday and STAY-TUNED for part two of "Saturday In The Park"!!! I sure hope you enjoy it as much as I have creating it! Got to LOVE Misty Cato's new FILE STYLES and Monica Larsen's SWEET flower actions!! !